So, yesterday I had some errands to run. And by 'errands' I mean I had a 40% off coupon at Banana Republic (yes, I still dress pretty corporate (except when wearing band T-shirts, and even then it's with blazers)). After some major frustrations in the dressing room, I ended up buying flats. Now, they were very much needed. After I busted my knee, I've needed to resort to non-heeled shoes more often than before, so I've come to notice a gap in the shoe closet. Flats. Let me tell you something: Flats are not counted as shoes. They are like socks, a necessary evil. I really don't like buying either. The list of necessary evils in the wardrobe are flats, underwear, socks and sports clothing. (I had to add "in the wardrobe" into the previous sentence, because if it just said necessary evils, the list would be too long and include things like dill* and sink strainers**) I hate shopping for any of those. These things are like toast for the wardrobe, when do you actually WANT toast? Seriously, you buy it every now and then and make sandwiches, but do you ever really crave toast?? No! So, to conclude: if someone (in this completely imaginary situation, let's say, husband) asks me, how many pairs of shoes I have bought this month, I can say two (these and these) and not count the flats. See how it works? Anyhow, since I had errands to run, Chris and I decided to have dinner in chinatown. Afterwards, we headed for the bus stop, but of course the bus just leaves when we are still across the street. Lucky for me (or unlucky if you are prone to count calories, which I certainly am not) there's a tiny little store next to the bus stop which sells all sorts of random goodies. I say random since I do not read Japanese. So when I happen to be in the neighbourhood, I often go browse in the store. I decided to buy something just based on the packaging. Today's pick seems to be sailboat flavoured. Turns out that sailboats taste like cola. Score! If you want to know more about these delicious treats, check them out HERE. All kidding aside, these things are amazing! They taste like sour cola candy. 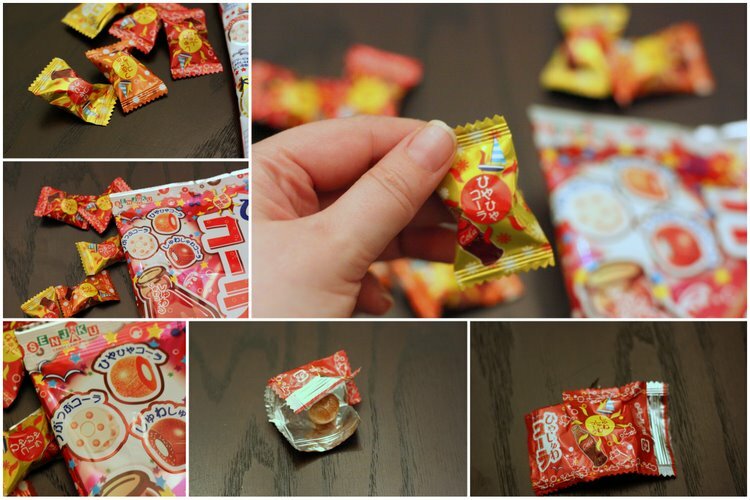 These are possibly my favourites of the Japanese candy I've tried so far. I'll start keeping an eye out for this company; Senjaku Candy Land. * dill, because unfortunately (especially in Finland) you can't really get fish dishes without dill. Also, pickles often are accompanied with this heinous weed. ** sink strainers. I really, really hate emptying those things, but if you don't have them you have to unclog the sink which I really, really, really hate. Looks awesome, makes our english snacks seem very boring in comparison! I think it's just what we're used to. I still get really excited when I find something new to snack on!